Table Management on Any Device. Our intuitive table management works on any device. 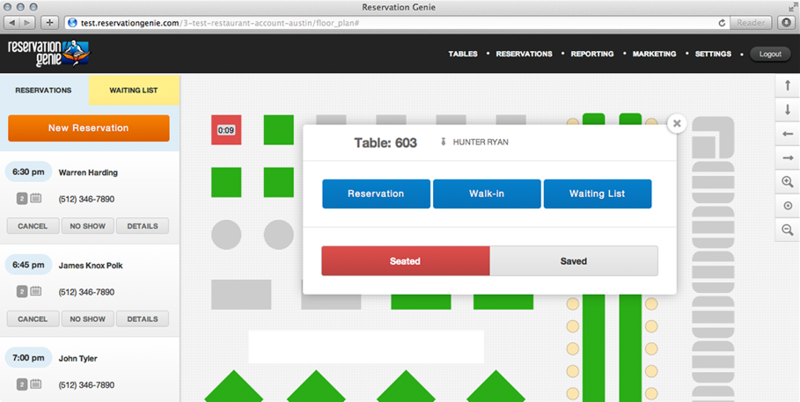 Seat reservations, walk-ins, and waiting list entries, track how long the guest has been seated, generate reports on your servers, and more. 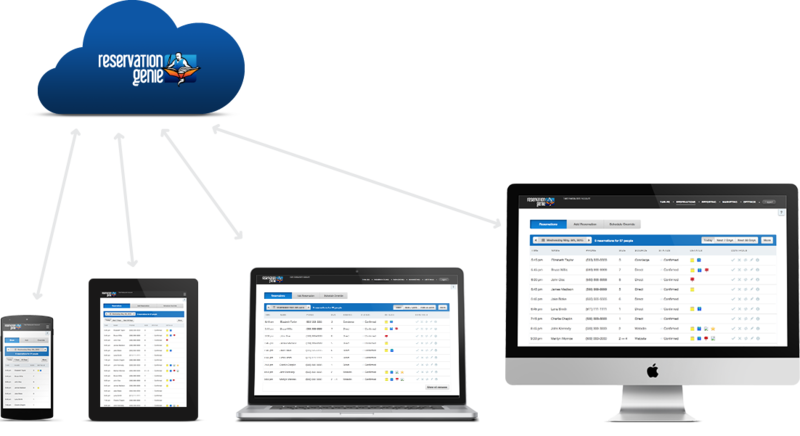 Use this link to learn more about our state of the art restaurant table management software alternative to Open Table. You can access your reservations from your phone, tablet, laptop, back office computer, hostess stand, and home computer. Because there are no equipment cost, we don't have to charge set up fees OR require a contract. Building relationships with your customers helps you deliver a personal experience. 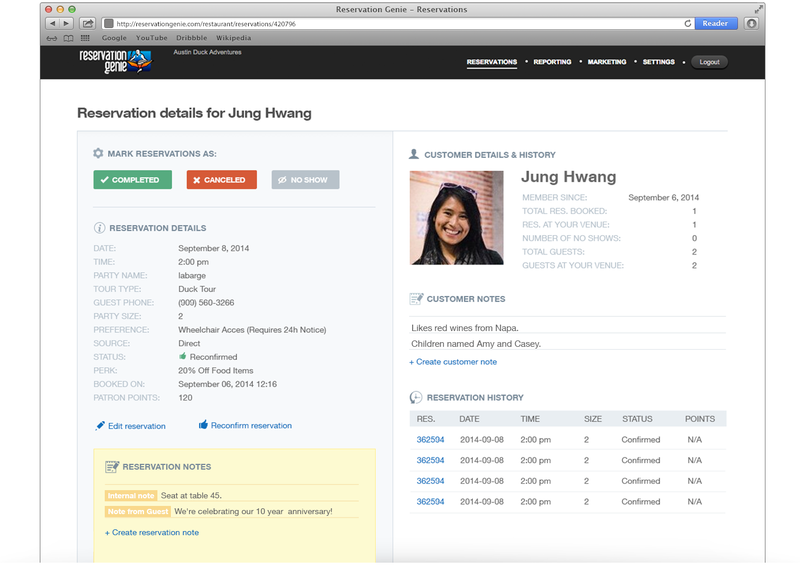 Our Customer Relationship Management tools (CRM) give you quick access to customer info, notes, reservation history, and profile pictures. It's lets you say things like "Hi John, glad to see you back. Would you like your regular table?" 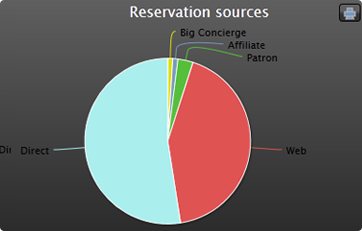 We divide reservations into different sources: direct (added by your staff), website, concierge, and affiliate site. Our Reporting section offers convenient graphs about each source that you can modify by date range and save as PDF. It enables you to track which websites are sending you the most customers and use that information to focus your online advertising. 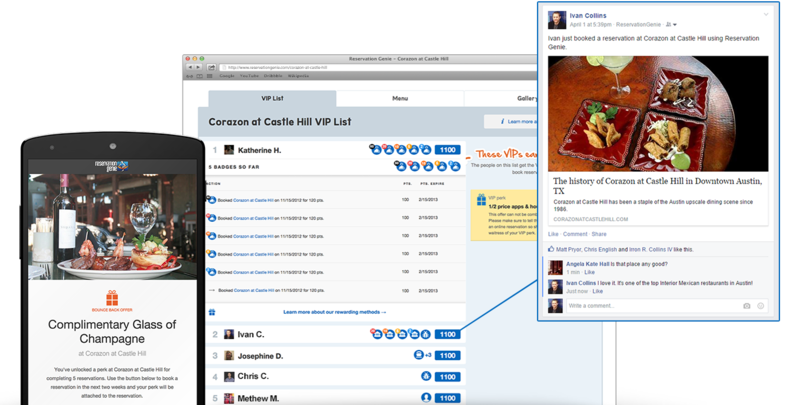 Use this link to learn more about our tools to track restaurant advertising and reservations here. Reservation Genie uses responsive design which means each page of our website changes shape to fit the screen of the person viewing it. With mobile users representing about 40% of all website visits, it's important that you cater to these users. 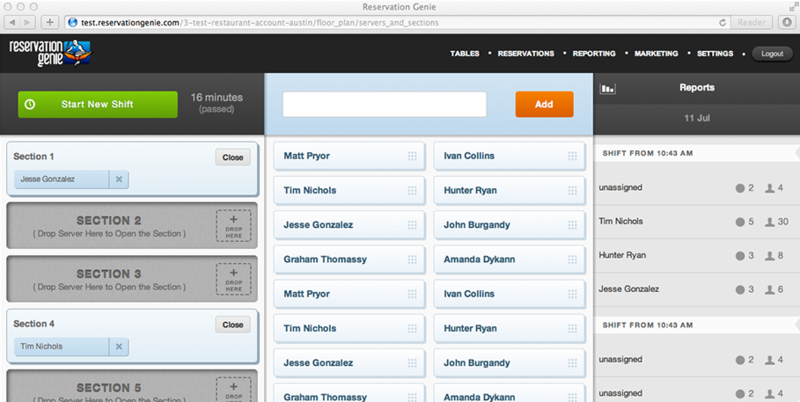 With Reservation Genie, your customers don't have to pinch to zoom in and out while booking. Our Loyalty Tools bring customers back more often. You set up a loyalty perk and it's automatically given to customers at different points in the customer life cycle. Your VIP list creates evangelists who host parties at your restaurant, talk about you on Facebook, and invite their friends. A Thank You offer helps drive first time customers back sooner. A We Miss You Offer reminds customers that have forgot about you to come back. Together they deliver an automated email marketing program that never skips a beat. 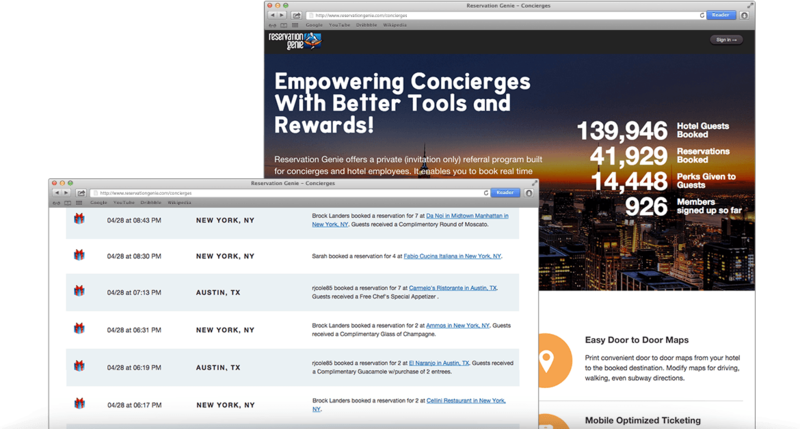 We give you tools to invite concierges to join your referral network, track their bookings, and stay on top of monthly referrals. You can set up a monthly gift card bonus to drive engagement and our site will send you a report each month letting you know what you owe individual concierges and where to mail referrals so you can take care of them promptly and avoid costly mistakes. 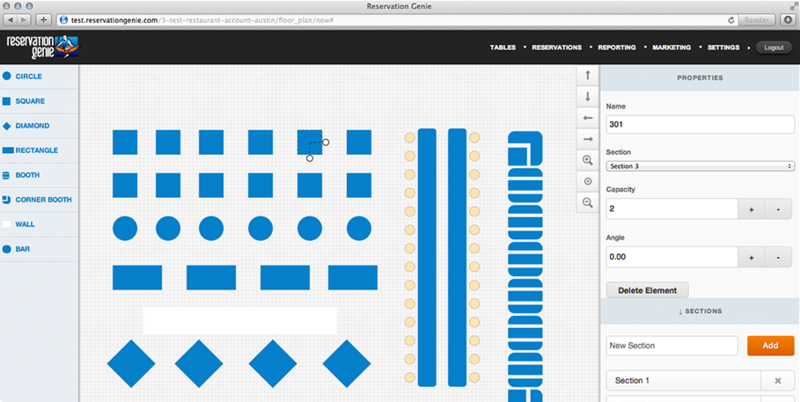 Reservation Genie helps you spread out traffic during busy times so you can triple seat more tables. You attach customized perks to early and late times of busy shifts. When customers are selecting the time, they may choose to come in earlier for a perk. Because the perks are customizable, you can enter anything that fits your brand such as a complimentary round of presecco, 10% off the check, or a complimentary chef's appetizer. These perks show up right when customers choose the time. Google is now penalizing websites that are not mobile optimized by ranking them lower in mobile searches. We built a tool that takes 5 minutes to install on your website and delivers a mobile optimized solution that is Google approved. You can change colors and backgrounds, feature videos and slide shows, highlight holidays, and offer online ordering, menus, etc. Visit our blog post to learn more about mobile optimized restaurant websites. Say Goodbye to Cover Fees! Reservation Genie starts at just $49 per month and never charges cover fees for reservations from your website, our website, or any website you configure to book through Reservation Genie. $49 Just Reservations Get online reservations and access to all our tools that turn reservations into marketing for only $49 with this package. + Table Management For only $79 per month, you can get online reservations and table management tools to help manage your restaurant. + $20 Total Website Care For only $20 a month more, you can get a dedicated web designer to manage your website. We'll update menus, manage your mobile site, add/remove holiday menus, promote special events, search engine optimize your site, and more. Learn more about restaurant website design.